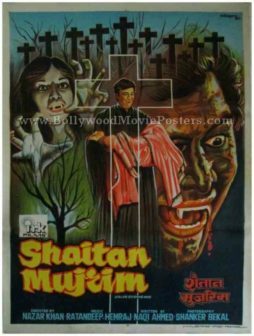 Old Indian horror movie poster for sale of the classic Hindi horror film, Shaitan Mujrim (1979). 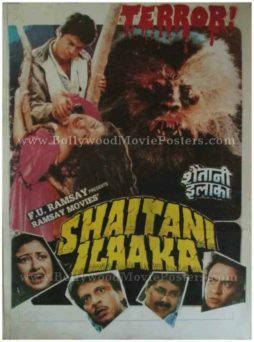 This is an actual surviving old Indian horror movie poster of the 1985 Hindi horror film that starred Rakesh Khanna and also featured a special appearance by superstar Rajesh Khanna. 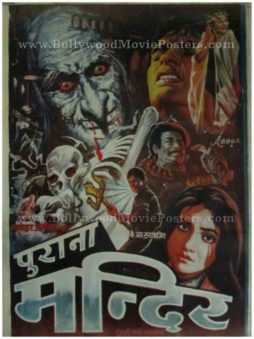 Printed and circulated during the original first release of the film (somewhere in the late 1970s), this old Indian horror movie poster was designed for publicity of the film but never ended up being used. This old Indian horror movie poster was originally designed in hand painted oil on canvas format by a leading art studio in Bombay. A cemetery and a withering tree at the bottom give this Indian horror movie poster a spooky setting. Brilliant hand painted portraits of a count Dracula like figure and a possessed woman are seen prominently in this old Indian horror movie poster. The center of the poster features a prominent crucifix. 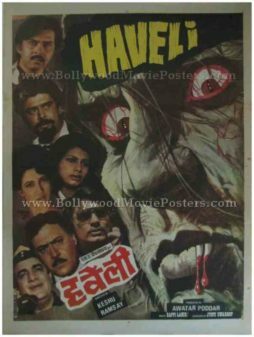 Bollywood horror movie poster for sale of the old Hindi horror film, Haveli (1985). This is an actual surviving Bollywood horror movie poster of the 1985 Hindi horror film directed by Keshu Ramsay that starred Rakesh Roshan in the lead role. Keshu Ramsay was a part of the Ramsay Brothers group (who are considered as the kings of Bollywood horror). Printed and circulated during the initial release run of the film (somewhere in the mid 1980s), this Bollywood horror movie poster was designed for publicity of the film but never ended up being used. This Bollywood horror movie poster was originally designed on a canvas board using a combination of both hand painted artwork as well as still photographic collage. The murdering ghost is seen in a hand painted rendition on the right hand side of this horror movie poster with blood dripping from his mouth. Faces of the lead characters from the film are seen in a brilliant photographic collage on the left of this Bollywood horror movie poster. The title of the film appears in radiant yellow on the top of this Bollywood horror movie poster for sale.